On April Fool's Day, the disturbing new Nest Predator Bounty Program was launched in South Dakota, and it's sadly not a joke. Through the end of August, residents young and old will receive $10 for each tail of a raccoon, striped skunk, opossum, badger or red fox they turn in to the state Dept. of Game, Fish and Parks (GFP). "Love seeing kids this excited about being outside!!" Governor Kristi Noem wrote on her Facebook page. 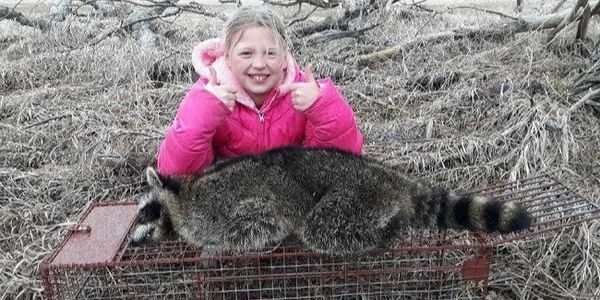 One of the photos accompanying her post was the one above: a little girl smiling and giving a thumbs-up gesture next to a dead raccoon. The purpose of the Nest Predator Bounty Program—which the GFP started without a public hearing—is to protect the nests of pheasants and ducks. But during a public forum on April 4, residents who opposed the program expressed their concerns, such as its negative impact on the ecosystem. One resident pointed out that human activities like using chemical fertilizers and draining wetlands is much more of a danger to pheasants and ducks than small predators. The GFP and supporters of the Nest Predator Bounty Program say it will bring back South Dakota's trapping tradition by getting more young people involved. But it's the 21st century, and there are humane alternatives to trapping available that can effectively control predators. Yes, kids (and adults) should be excited about being outside—to respect wildlife, not to destroy it. Please sign and share this petition urging Noem and the GFP to end the Nest Predator Bounty Program.